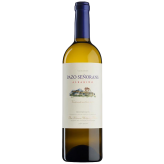 Pazo Señorans, one of Galicia’s best producers, focuses entirely on the indigenous Albariño varietal. This estate, a family business based on the site of a rural 14th century manor house (a pazo), benefits from a location in Rías Baixas, one of Spain’s most prized wine-making regions. The Maritime climate here in the northwest corner of Spain differs from the rest of the country: whereas most of Spain battles with drought, Rías Baixas is surprisingly verdant. This is a spot where aromatic white grapes thrive. The estate has grown grapes long before it got involved in wine production. Its vineyards are located at a relatively low altitude on Rías Baixas’ unique xabre soil, dense granite that is split and crumbled by the humid environment. To combat the potentially detrimental impact of humidity, vines are painstakingly pergola-trained high to encourage air circulation, and fruit is hand-harvested. Rather than large tracts of land, grapes come from a patchwork tiny “micro-plots” that form a sort of vineyard quilt through Galicia.